Alzheimer’s disease (AD) is a progressive and deadly neurodegenerative disease that is characterized by memory loss, cognitive impairment and dementia. Several hypotheses have been proposed for the pathogenesis based on the pathological changes in the brain of AD patients during the last few decades. Unfortunately, there is no effective agents/therapies to prevent or control AD at present. Currently, only a few drugs, which function as acetylcholinesterase (AChE) inhibitors or N-methyl-Daspartate (NMDA) receptor antagonists, are available to alleviate symptoms. 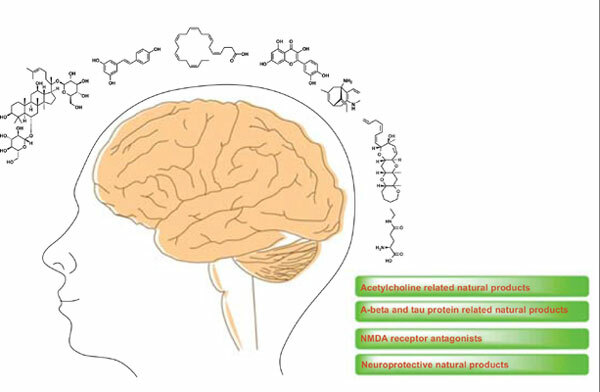 Since many small molecule natural products have shown their functions as agonists or antagonists of receptors, as well as inhibitors of enzymes and proteins in the brain during the development of central nervous system (CNS) drugs, it is likely that natural products will play an important role in anti-AD drug development. We review recent papers on using small molecule natural products as drug candidates for the treatment of AD. These natural products possess antioxidant, anti-inflammatory, anticholinesterase, anti-amyloidogenic and neuroprotective activities. Moreover, bioactive natural products intended to be used for preventing AD, reducing the symptoms of AD and the new targets for treatment of AD are summarized. Alzheimer's disease, Acetylcholinesterase inhibitors, Antioxidants, Anti-inflammatory, Neuroprotective, Neurofibrillary.